New Zealand has a serious problem with cold, damp homes. A 2010 survey by BRANZ found 44 percent of rental properties were in poor condition. Recently, two deaths linked to inadequate heating and insulation have led to renewed calls for a housing warrant of fitness. The results of a separate 2014 WOF trial involving private rentals, carried out by the University of Otago, the New Zealand Green Building Council, ACC and several councils, showed there’s considerable work to be done to bring our rental stock up to an acceptable standard, with only 6 percent of houses passing. Earlier this year, Labour MP Phil Twyford’s Healthy Homes Guarantee Bill, which would have required every rental to meet minimum standards for heating and insulation, was drawn from the ballot. The bill was defeated at first reading on a vote of 60-60 with National and Act opposed. When approached for comment, Housing Minister Nick Smith said the government “is open-minded around minimum quality standards for rentals” but “any housing warrant of fitness scheme must be balanced with issues of cost and supply”. This month, the government announced every rental property in New Zealand will have to be fully insulated (ceiling and underfloor) within four years. Landlords will also be required to install smoke alarms. We think this is a great start, but doesn’t go far enough. We continue to call on the government to place a greater priority on improving the quality of rental housing, especially with regards to efficient heating. Sub-standard rentals have been linked to higher rates of respiratory disease in socio-economically deprived communities. Insulation is a good start, but doesn’t make much of a difference when there’s no warmth to keep in. Of the 144 private rental properties assessed in the 2014 trial, eight (6 percent) passed. However, an additional 30 percent could have been brought up to standard with a few low-cost fixes. The most common reasons for failure were: water temperature falling outside the acceptable range (40 percent), lack of security stays on windows (38 percent), no fixed heat source (37 percent), non-compliant handrails (31 percent) or a lack of smoke alarms (30 percent). A survey of the landlords involved in the trial showed two-thirds supported the idea of a rental WOF. Most said they were motivated by a desire to learn about the WOF and “see how their house stacked up”. The inspection cost about $300 per house to administer. New Zealand Property Investor’s Federation executive officer Andrew King said some aspects of the checklist were “patronising” to tenants and already covered in the Residential Tenancies Act. He said that regardless of minimum standards, “energy efficient heating and insulation should be tax-deductible expenses, to keep the cost for rental property owners down and reduce the size of rent rises”. As for the tenants involved in the trial, 69 percent had a positive experience of the process and supported the idea of a WOF. They didn’t find it much of an inconvenience either, with an average inspection time of only 51 minutes. The following are the criteria used in the 2014 trial, developed by the He Kainga Oranga/The Housing and Health Research Programme at the University of Otago. Much like a vehicle WOF, the checks are pass/fail. For a more detailed look at what they mean and how you can bring your home up to standard, see What can you do?. If you’re a tenant, use the checklist to conduct your own assessment. Talk to your landlord if your rental fails any of the criteria. While the WOF hasn’t been adopted, landlords are legally required to keep the house in a reasonable state of repair and comply with building, health and safety requirements. You can view the full checklist on page 59 of this report. We thank He Kainga Oranga/The Housing and Health Research Programme for letting us publish their checklist. We’ve broken down the checklist used in last year’s trial and looked at what you can do to ensure your home would make the grade. Essentially, it boils down to making sure your home is safe, secure, warm, dry and has all the essential amenities. The relevant criteria from the checklist are shown in italics under each subheading. Bedrooms: Smoke alarm within 3m. The checklist required an operational smoke alarm within three metres of every bedroom. Ideally, they will be fitted to the ceiling of every sleeping area and living-space. We recommend against ionisation smoke alarms as they are poor at detecting smouldering fires – use photoelectric or dual sensor models instead. This will be clearly marked on the packaging. For more information visit our smoke alarms and batteries test. General: Handrails and balustrades to code. Balconies and decks higher than a metre off the ground need to be fitted with a barrier, not just a handrail. All stairs, inside and out, are required to have handrails. The gaps in your balustrades (for both balcony/deck barriers and staircases) shouldn’t be any wider than 100mm to prevent children falling through. Kitchen & laundry: Hot water temperature at tap 55°C +/- 5°C, potable water supply. Hot water from your taps must be between 50°C and 60°C, but ideally should be below 55°C. The best way to achieve this is to set your cylinder’s temperature at 60°C – any lower and bacteria will start to breed. If you find the water’s still too hot at the tap ask a qualified plumber to adjust the tempering valve. There must be a reliable source of potable (drinkable) cold water plumbed into your home. The water should be visibly clean, and fittings need to be secure and free from leaks. If there’s a supply of non-potable water, like untreated rainwater, this should be clearly labelled. Kitchen and laundry, bathroom and toilet, living areas, bedrooms: Visibly safe power and light switches. Check your power outlets and light switches don’t have cracked or missing faceplates, exposed cables, or emit a humming, hissing, or clicking noise, they’ll need to be replaced by a qualified electrician. Lights in staircases and hallways should have switches at each end. Kitchen and laundry: Secure storage (1.2m high or child-safe lock). Make sure you’ve got secure cupboards or shelves for keeping hazardous substances out of reach of children. They can either be lockable, or high enough off the ground (at least 1.2m). All entrances to your house need to be fitted with locks. Windows and other openings also need to be able to be secured. General: Two effective methods of egress. There needs to be at least two clear exits from your house. This check proved a bit controversial in the trial as there’s often no way to provide two routes out of an apartment if there’s a fire. As a result, it was decided flats, apartments and some multi-unit dwellings could seek an exemption if they’ve got one escape route that meets all relevant codes and standards. Living areas: Opening window (each area) with secure latch. Window security stays (where required). Bedrooms: Window stays (if required). Security stays on ground-floor windows allow you to air your house while keeping it secure. Any window that presents a fall risk needs a latch preventing it from opening further than 10cm. After the trial, landlords and assessors said they found the inclusion of windows stays the most problematic item on the checklist, because they weren’t thought necessary on every window in the house (such as high windows). There was general agreement that this requirement would be dropped were the WOF to be implemented nationally. Kitchen and laundry, bathroom and toilet: Effective ventilation to the outside. Living areas, bedrooms: Opening window, with latch. Window stays (if required). Make sure every room in your house can be aired, either by opening windows or doors, or with a mechanical ventilation system. Downstairs windows require stays allowing you to ventilate the room while keeping the house secure. Accessible spaces under your house require air vents, and clothes dryers need to be properly vented to the building exterior (unless you’ve got a condenser or heat pump model). The checklist also required homes to be reasonably free of visible mould. If the total area of mould was bigger than an A4 sheet of paper, the house failed. Kitchen and laundry, bathroom and toilet, living areas, bedrooms: Wall and ceiling linings, and floor intact. General: No cracks, holes in roof or external cladding. No missing windowpanes. Make sure your house is weather-tight by checking for cracks and holes in your roof and external cladding. You also need to address any obvious slip hazards, like moss on decks and pathways. Living areas: Heating, fixed, effective and safe. Thirty-eight percent of houses in the trial did not have a fixed form of heating. Portable electric heaters are fine for taking the chill off smaller rooms, but aren’t efficient as a primary heat source. Make sure you’ve got a heat pump, woodburner or central heating system that’s powerful enough to keep your living areas at a comfortable temperature. ANorth Island localities more than 500m above sea level need to meet the South Island requirements. These are the bare minimum heating requirements. 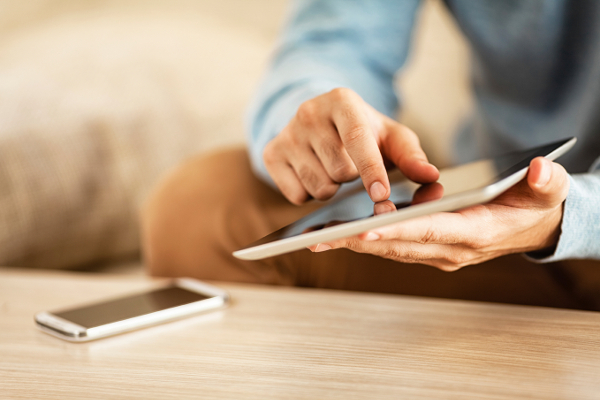 Use our calculator to work out what size heat pump best suits your needs. Ceiling: Insulation to requirements (120mm), no gaps tucks, or folds, no dampness in insulation, clearance from lights, ducts and roof, thermoplastic insulated cabling. Underfloor: Insulation to requirements (foil or bulk), dry underfloor, ground vapour barrier, no ponding. Ceiling insulation needs to at least 120mm thick, while underfloor insulation can be either foil or bulk type of any thickness. Check there’s no dampness, gaps, tucks or folds. If insulation is not practicable to install (e.g. if there’s no space in the ceiling cavity), extra heating is required. All cabling needs to have thermoplastic insulation. The tables below show the new overall R-values (insulation performance) for wall, roof, floor, and glazing required in different parts of the country for timber-framed houses. See the Building Code for more information. If there’s an accessible, fully enclosed area under your floor, you should install a ground vapour barrier, especially if water pools under your house or the soil is always damp. This is a sheet of heavy polythene (or similar) laid on the ground and taped to all joints and piles. It needs to reach a few centimetres up the walls. This does not apply if you have a concrete floor. See our database of more than 200 insulation products to find which is best for your home. Living areas, bedrooms: Curtains/drapes present. The trial WOF checklist required all windows in living areas and bedrooms to have curtains (unless they were double-glazed with an R-value of at least 0.3). We found the way curtains and blinds are fitted is more important than their material or thickness. Ensure they form a good seal against all sides of your window frame. Kitchen and laundry: Adequate food preparation and storage. 0.5m3 for a one-bedroom house. 1.0m3 + an additional 0.2m3 per bedroom for a house with more than four bedrooms. The WOF also required a kitchen to have a functioning and safe stove and oven, and some way of ventilating steam from the stovetop. If there was no mechanical ventilation, like an extractor hood, there needed to be an opening window closer than two metres from cooking facilities. Kitchen and laundry, bathroom and toilet, living areas, bedrooms: Working artificial lighting. Every room in your home must have at least one working light. Plug-in lights, like desk lamps, don’t count. Staircases also require a working light, with a switch at the top and bottom of the stairs. There also needs to be lights illuminating entrances and paths. Bathroom and toilet: Operational toilet, sewage connection functional, functioning bath or shower waste water drain connected. The WOF checklist required every house to have a suitably located bath or shower in “good working order”. This means visibly clean water must flow at a good rate from intact taps/showerheads. As in kitchens, the water from the hot taps in the bathroom should be between 50°C and 60°C. We support a mandatory rental housing WOF. We believe it would be an important part of a multi-pronged approach to reducing New Zealand’s rates of respiratory illnesses and improving the quality of rental housing. The best way to ensure your home is warm and dry is to install an efficient, fixed form of heating, make sure you have adequate ceiling and floor insulation, regularly air your home and tackle sources of dampness. 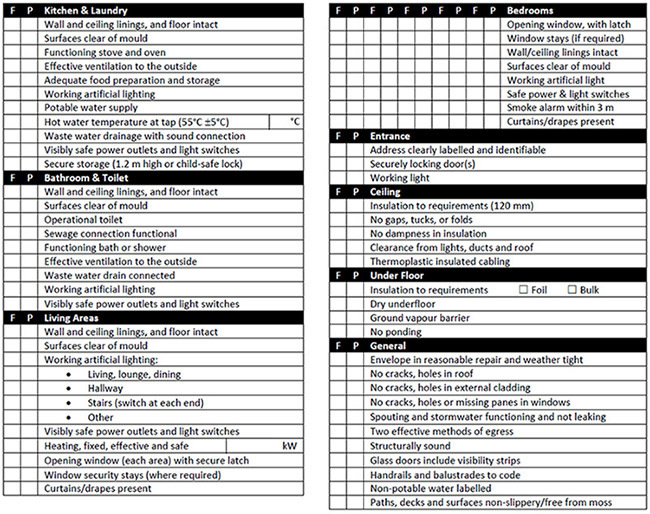 If you’re a tenant, conduct your own WOF using the checklist. If your home fails, talk to your landlord about making the required improvements. Tenants can issue a 14-day notice to the owner to get their property fixed up. If the owner doesn’t respond, you have the right to go to the tenancy tribunal.